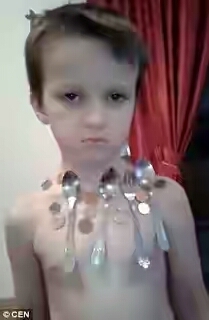 A five-year-old Bosnian boy with magnetic ‘superpowers’ has become an online sensation. Erman Delic, from the village of Malešići near Gracanica in Bosnia and Herzegovina, is described by doctors as totally healthy despite being a ‘human magnet’. His family recorded the footage and posted it online, where it has since gone viral with thousands of views. By the end of the short clip three spoons, 13 coins and a fork are seen stuck to his chest, with more still on his back as though they had been glued on.